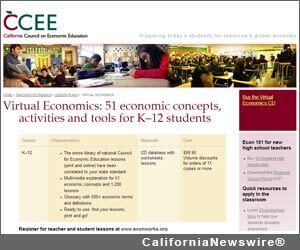 LOS ANGELES, Calif. /California Newswire/ — CCEE (California Council on Economic Education) recently received an $8,000 State Farm Grant to provide financial education training to teachers through the Virtual Economics 4.0 program. The teachers trainings are intended to help educators increase student understanding of economic, personal finance, and entrepreneurship concepts. State Farm, one of the nation's largest insurance companies is partnering with the Council for Economic Education (CEE) and CCEE, in supporting the America's Promise Alliance with its Grad Nation campaign goal to end the high school dropout crisis and prepare young people for college and the 21st century workforce. Virtual Economics 4.0 is the nation's most comprehensive educational resource for teachers of economics and personal finance. It includes 51 key economic concepts, a glossary with 500-plus terms and definitions, and over 1,200 activity-based lessons, each accompanied by a multi-media demonstration. All lessons are aligned with California's Common Core Standards in Mathematics, Reading, English/Language Arts and History/Social Science. Samona Caldwell, State Farm Public Affairs Specialist describes the grant as part of "State Farm's mission of giving all children access to a first-rate education through accountability-based education that identifies goals, measures and promotes collaboration." Teachers' demand for CCEE's training opportunities increased dramatically in 2012 more than ever before. Through its wide network and superb teachers and students outreach, CCEE is able to reach a wider array of teachers to ensure that Economic Reasoning is being taught in California classrooms. "Because of our continued work with Superintendents, Principals and District Administrators in California's low and moderate income communities, CCEE has had no problems filling up our training sessions and many are overcommitted," says Elle Charles, Director of Teacher Relations at CCEE. State Farm and its affiliates is the largest provider of car insurance in the U.S. and a leading insurer in Canada. In addition to providing auto insurance quotes, they serve 81 million policies and accounts – more than 79 million auto, home, life and health policies in the United States and Canada, and nearly 2 million bank accounts. Commercial auto insurance, along with coverage for renters, business owners, boats and motorcycles, is also available. State Farm Mutual Automobile Insurance Company is the parent of the State Farm family of companies. For more information, please visit http://www.statefarm.com . For nearly a half-century, California Council on Economic Education, a 501(c)3 nonprofit organization, has been dedicated to advancing the economic reasoning and financial literacy of Californians. CCEE prepares students to participate in the global economy by providing educational programs and materials to K-12 teachers. Information about professional development for teachers, workshops, programs and student contests can be found at http://www.ccee.org/ .